With legal marijuana sweeping the United States and Canada, cannabis industry players are taking it on themselves to make cannabis not just okay, but completely normal. That means a proliferation of brands pushing all the markings of a tech startup — brightly colored products, an emphasis on quality, and open, airy shops — to joints, vaporizers, and dispensaries. According to Chris Burggraeve, a former Coca-Cola and AB InBev executive-turned cannabis startup founder, weed companies adopting minimalist colors and clean lines makes perfect business sense. Marijuana carries a historical baggage that most of its category rivals, from alcohol to pharmaceuticals, lack. As an increasing number of states legalize marijuana, companies have the opportunity to not just sell weed but create brands in an explosive industry. While marijuana is not quite a blank slate, companies have the chance to decide whether they want to market it with its old, stoner-centric image or to adopt the trappings of a tech brand like Apple. “Think about the breakdown: What proportion of people want the Apple Store experience?” Burggraeve told Business Insider. According to Burggraeve’s estimates, customers who enjoy more potentent cannibas options and likely have accepted the marijuana’s current reputation, make up a roughly market of roughly 2 million people. Those who would feel more at home at an Apple Store that sells marijuana products instead of iPads account for 50 million people — a much larger market, worth billions of dollars. Herbessntls packages CBD-infused skincare in chic white bottles. And, MedMen is on its way to becoming perhaps the first American $1 billion marijuana startup thanks in part to its chain of slick, high-end marijuana dispensaries. 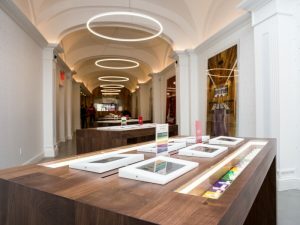 “We want the store to show our vision of the future for cannabis,” Daniel Yi, a senior vice president at MedMen, told Business Insider earlier this year. Yi’s vision — like the vision of dozens of other marijuana startup founders — is a sleek place you’d be comfortable visiting with your grandmother and tween cousin alike. The only question is which companies will get a slice of the multi-million dollar payout.